Bridging and Bonding are often confused with each other. While they may sound similar, they are two very different technologies. Network bridging is hardware or software that acts as a link between two networks allowing them to act as one. This means devices on two separate networks would be able to “talk” to each other as if they were a part of the same network. 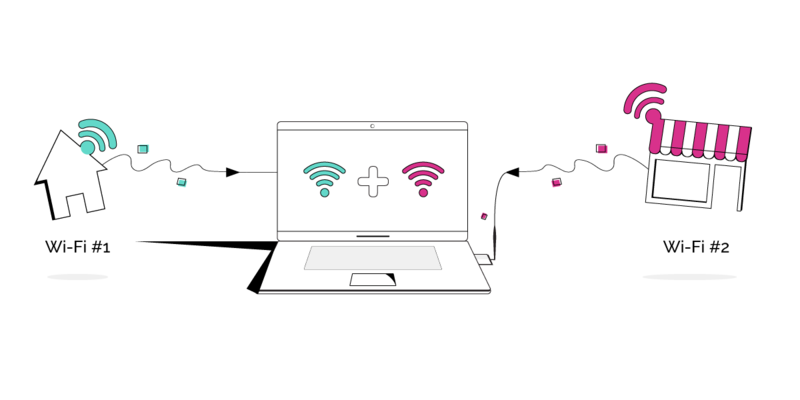 Bridging is one of the features offered in Connectify Hotspot MAX. When you select 'Bridged' as the network access mode when creating a WiFi hotspot or a wired router, it allows devices on your Hotspot and shared network to communicate with each other directly, as if they were part of the same network, without going through a NAT. Connectify Hotspot doesn't work in Bridged Mode in regards to PDANet. What is Network / Channel Bonding? Network or Channel Bonding involves the aggregation of multiple Internet connections so that download and upload speeds are added together. If you were to bond a broadband connection of 10Mbps and another connection of 5Mbps you could potentially get a maximum speed of up to 15Mbps. You can even bond smaller connections together; like 3 smaller broadband connections of 3Mbps for speeds up to 9Mbps and so forth. Bonding gives you the ability to achieve a faster connection without having to upgrade to a much more expensive Internet package. Speedify is a software app that offers bonding, which is why Speedify is an excellent alternative to upgrading your Internet speed. As you can see, the two technologies are different things. In short, when you see 'bonding' - think of the word ‘combine’ like how Speedify can combine multiple internet connections into one big connection. And when you see 'bridging' think of the word ‘link’ similar to how Connectify Hotspot acts as a link between the shared network and devices on your Hotspot.